Proclaim the meaning of the day! 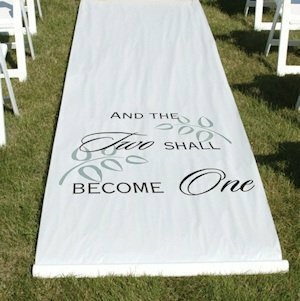 'And The Two Shall Become One' is printed in black ink eight feet from the end of this white rayon fabric runner. 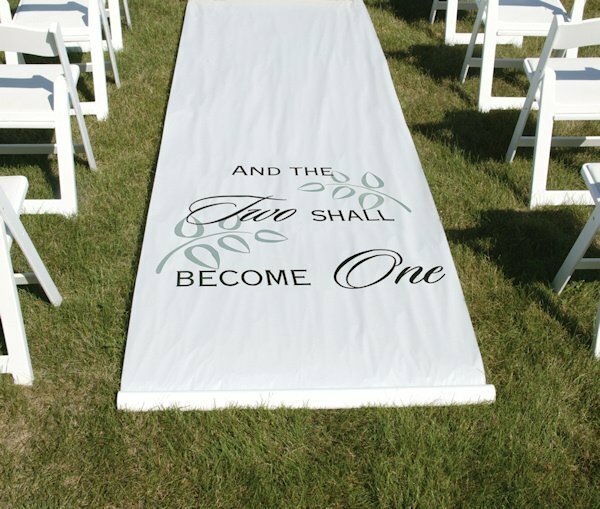 A subtle, grey leaf design is also included in the printed image on this And The Two Shall Become One aisle runner. Your guests will be able to read the phrase at the back of the aisle as they walk down to be seated at your wedding. The runner is 36" x 100' long and has a pull cord for convenient unrolling. Adhesive strip at top of runner secures to surface. I would like to know if I could have the words on the runner that says and the two shall become one in purple ink. I'm sorry the The Two Shall Become One' is only printed in black ink. I want to get a personalized runner. I'd like it to say "RIDE WITH ME FOREVER #OURLOVESTORY" Is it possible to have that made? We can only add names and a date to our personalized runners and they include a standard message. I'm sorry, we're not able to add a custom message. Available options can be found here.